Just over a week ago, I had a lovely day out in Herefordshire, attracted by The Folding Society‘s “Origami Ride” for July. An early start saw me pedal to Northampton railway station for the ticket office to open at 6.00 a.m. Why not use the ticket machines as I normally do? I wanted a “West Midlands Day Ranger” – travel anywhere in the West Midlands for a day for £14.50 (Railcard price); I bet you didn’t know that both Northampton and Hereford are in the “West Midlands”! Anyway, it’s cheaper than buying a Northampton-to-Hereford off-peak day return. At that time of the morning, the trains were very quiet, both from Northampton to Birmingham New Street and then from New Street to Hereford. Hereford railway station is just to the north of the city centre – the right direction for Leominster – and a quick climb of Aylestone Hill brings you to lovely country roads. Quiet again on a Saturday morning and still quite cool during this heatwave, the route I’d planned took me through Sutton St Nicholas and Bodenham. Two hundred yards on the A49 and then a B road in Leominster. I’d only cycled once before in Leominster – during my Land’s End to John O’Groats trip in 2010 when I stayed at Leominster Youth Hostel behind the Abbey. This time I met up with the Folding Society at Savery’s Café on Broad Street. As ever, FoldSoc members are very socialble indeed and, as we chatted over coffee and cake, we had to be reminded that we were there for a bike ride! Local riders chatted about cycling in Herefordshire and, not too far away, in The Malverns – with an Elgar cycling route – so that’s been added to my “must do” list. In Kingsland we missed a turn because the leader and I were deep in conversation but we were soon at Shobden and its airfield where a converted WWII Nissen hut was to be our lunchtime café. I enjoyed the draught cider which was nice and cold on the hottest day of the year so far! Not quite up to Normandy cider though! After Shobden, it wasn’t far to Eardisland and a quirky village tea room run from the proprietors’ house – we sat under the shade of trees in their back garden. The shortest leg of the day was back from Eardisland to Leominster. 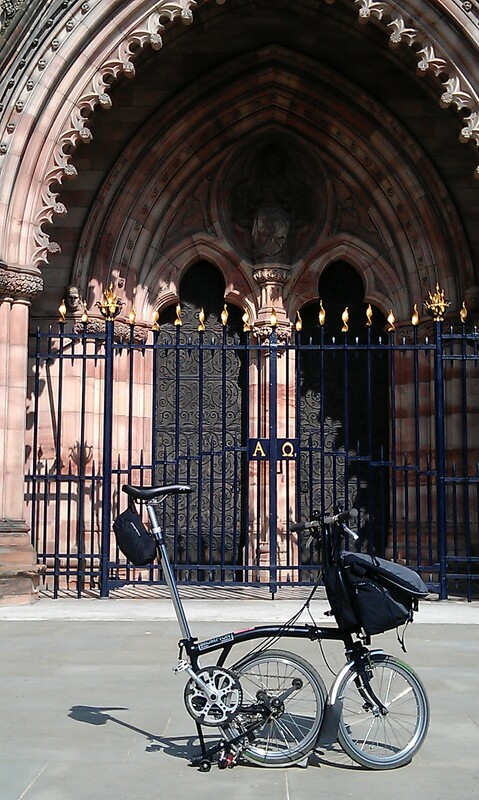 After quick good-byes to my friends, I pedalled back the way I had come to Hereford. It was hot but my Brompton moved quickly and it felt great. I went past the railway station and into the city centre to look at the Cathedral. The trains were as pleasant on the return journey as they had been in the morning and by the time I pedalled home from Northampton railway station it was just about nine o’clock in the evening. A splendid day out! Fifty-five miles pedalled on the Brompton. A map of the route in Herefordshire here.